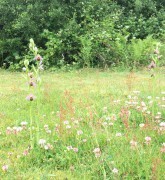 We are based in the heart of Norfolk on the edge of Broads National Park. Our grounds cover over 20 acres of stunning countryside making the ideal place for families, couples and groups to escape and relax. We offer a range of fully equipt contemporary luxury holiday cottages and lodges to let throughout the year. Each lodge can sleep between 4 and 6 people within the 2 bedrooms. Find out full details on our lodges on our accommodation page. Our peaceful surroundings makes an ideal place for fishing in Norfolk. We have 5 fishing lakes making up around 7 acres of water with a growing repuation for producing some of the hardest fighting and powerful fish within the Anglian region. Craig's had some great fish out of the lakes recently! 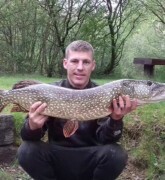 Here are some of Craig's recent catches from the lakes. Notably 26lb 12oz Carp and 19lb Pike! 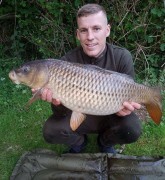 Craig looking very pleased having caught this lovely 14lb Common Carp on the main lake using sticky baits krill.